I have only slightly changed the recipe from the original by adding chickpeas for an extra boost of protein and texture. What I really love about this recipe is the versatility and ease! The vegetables can be pretty much anything you like. You don’t need to use all of the ones listed in the recipe, 3 or 4 would be just fine. Use red or gold potatoes in place the sweet potato. Switch it up and use butternut squash, pumpkin or any other winter squash you might like. You may like to add earthiness by using cubed beets. Try cauliflower florets in place of broccoli. Really anything goes here. As for the sauce, it’s quite savory and delicious! All the flavors here come together and you’ll be in comfort food heaven! This recipe is easy to pull together and makes for a great hearty meal in these cooler months. It’s full of protein and fiber, is low in fat and has plenty of essential nutrients needed to maintain a healthy plant based diet! Roast: Line roasting pan/baking dish with silpat, parchment paper or grease lightly with neutral oil. 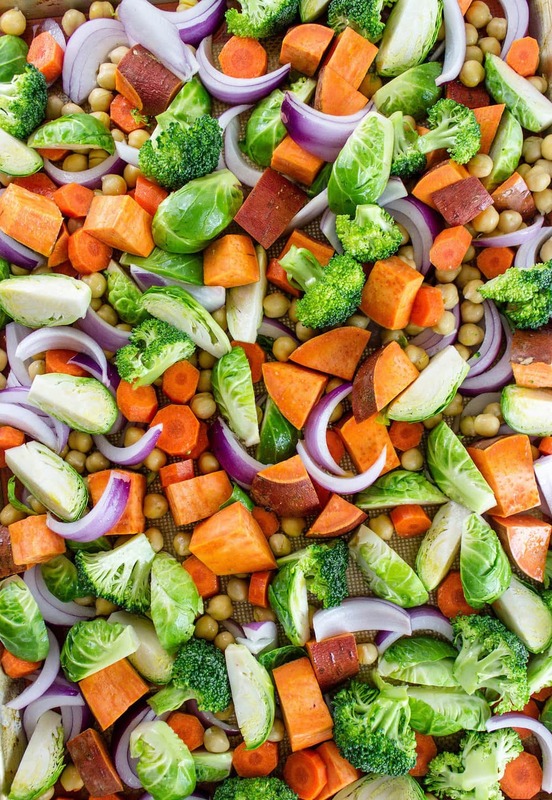 Add vegetables to roasting pan and toss to coat with olive oil. Arrange vegetables in a single layer (as much as possible), sprinkle with salt and pepper to taste. Roast vegetables until tender and lightly browned, about 45 minutes, mixing once halfway through. Grain: Start your grain of choice while vegetables are cooking. Quinoa will take about 30 minutes. Sauce: Prepare your sauce by placing all the ingredients into your food processor/blender, except for the herbs, and process until smooth. Add extra broth as needed to thin. Add in herbs and pulse once or twice. Place sauce in a small saucepan and heat over low heat, uncovered, until warm, stirring occasionally. 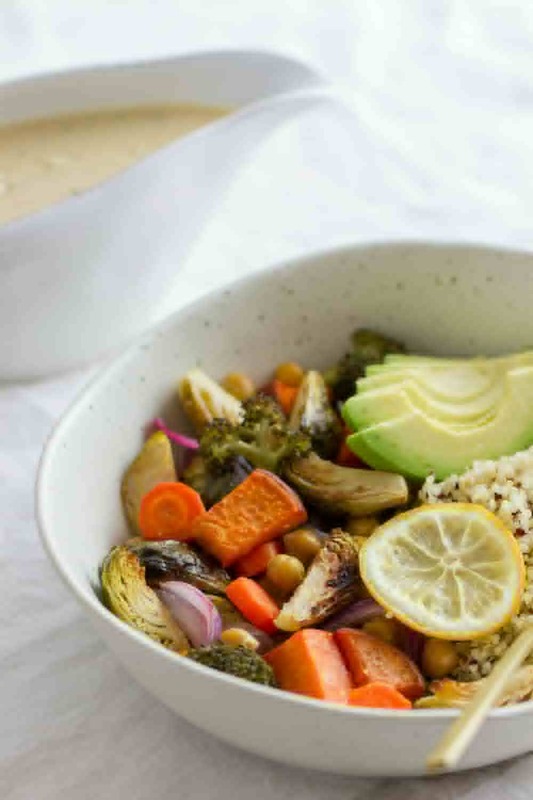 Roasted vegetable and chickpea bowl is a clean, vibrant, healthy and satisfying meal to enjoy often! 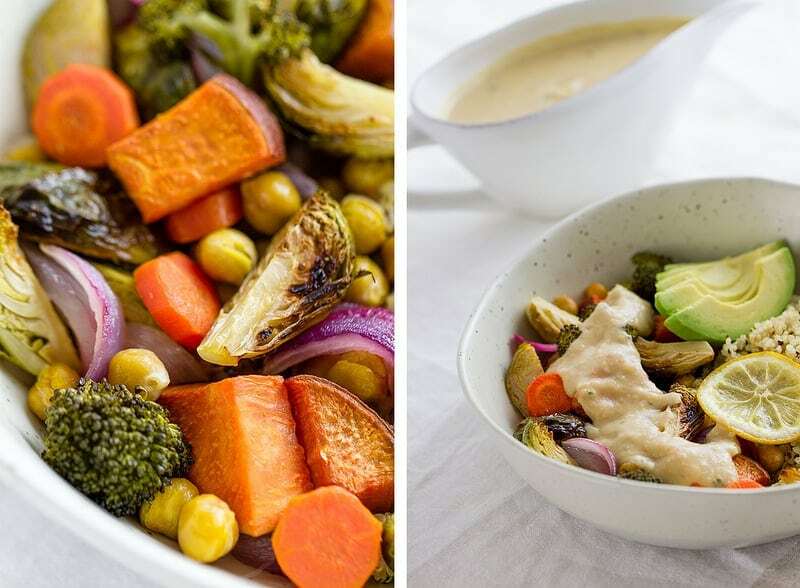 Roasted vegetables and a creamy lemony bean sauce make for a hearty, healthy lunch or dinner! 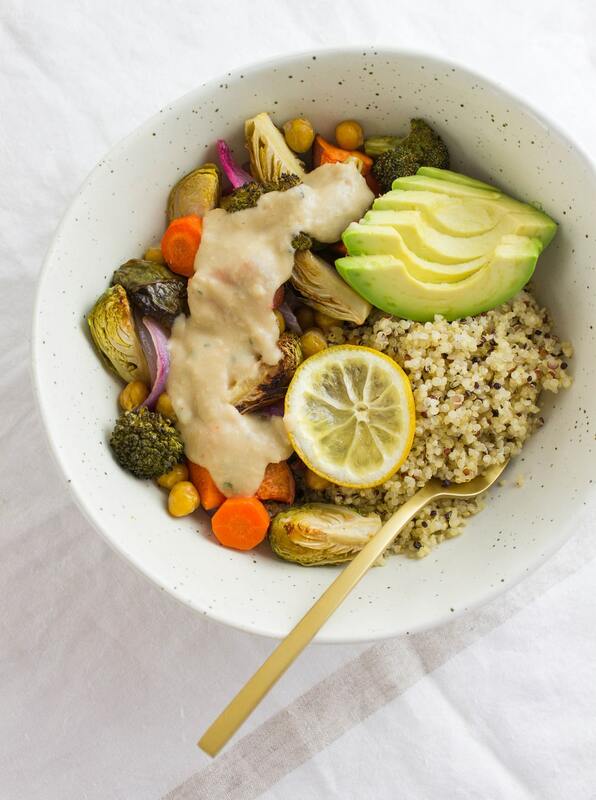 Serve: Serve vegetables with grain of choice and a nice helping of sauce over top. Serve warm. Store leftovers in refrigerator for up to a week. Leftovers are just as delicious! This sauce sounds awesome! 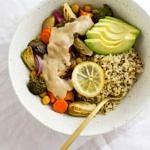 We have roasted veggies and a grain weekly and I am always looking for a new sauce! I'll have to try this! It's great for the weekly rotation. So easy too. Enjoy! [ Smiles ] That is one impressive vegan recipe!